Tuesday December 4th 1900 The old man was busy till noon cleaning the sewing machine and the big clock. Mort Hoffman came down to help husk corn. Will and I went to Hill Siding for some things in the afternoon. read in the evening Wednesday December 5th 1900 I ironed this forenoon and Will went to help Frank Stevens haul hogs to River Junction. I did some mending in afternoon and raked in the yard weather fine Thursday December 6th 1900 I took time to write to Mother this morning and some notes I needed to write. Will took his hogs to River Junction they brought $243.39 (14 of them) It snowed most of the afternoon the boys could not husk corn. Churned once Friday December 7th 1900 I churned again today did a lot of baking so I can go to town tomorrow. Leonard stayed in the field till dark and kept the supper late. He tried to get a piece of corn finished and over-loaded the team. 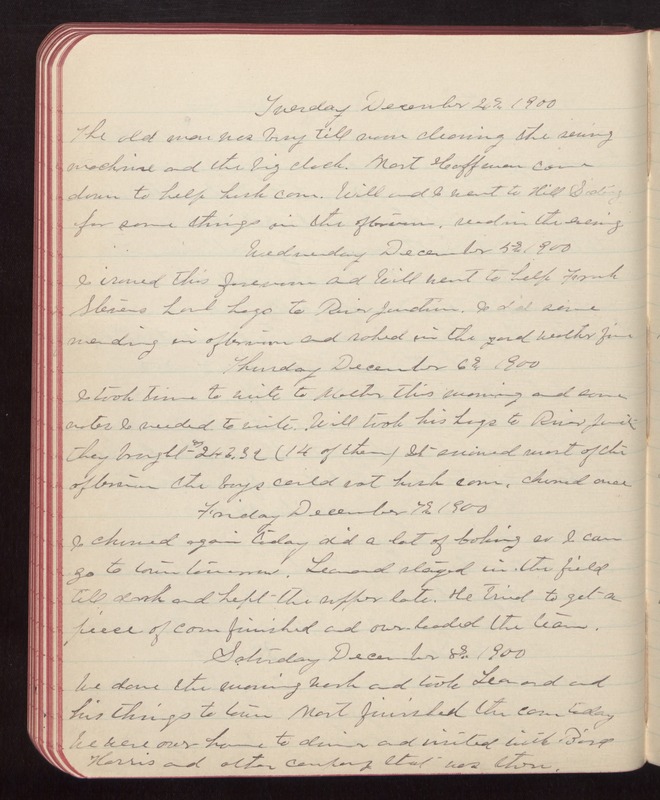 Saturday December 8th 1900 We done the morning work and took Leonard and his things to town Mort finished the corn today We were over home to dinner and visited with Bird Harris and other company that was there.